Who uses slides and rails? 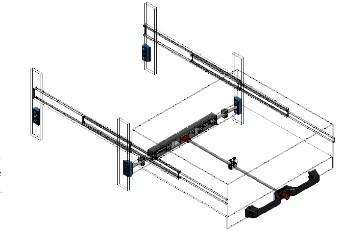 Chambrelan is a leading European manufacturer of rugged industrial grade telescoping slides and linear ball rails. Customers around the world choose Chambrelan slides for demanding applications such as electronics racks, emergency vehicles like ambulances and fire engines, tow trucks, automatic doors, medical equipment , aircraft avionics racks, ATMs, vending machines, kiosks, machine tools and packaging equipment. A major market for Chambrelan products in the US and around the world is the transit industry. Heavy batteries are typically located under the car floor of locomotives and the latest battery powered buses. Access is simplified with Chambrelan telescopic slides which allow even the heaviest batteries to slide out from under effortlessly for access. Chambrelan ball bearing slides are produced in aluminum, steel, and stainless steel and are designed to support loads of up to one ton and higher. As Chambrelan’s exclusive United States Distributor we offer Chambrelan’s superior technology, competitive pricing, delivery FOB Deland FL , US dollar pricing and credit card or net terms. Our US industrial customers use Chambrelan slides for packaging equipment, machine tools, tow trucks, buses and locomotives. For ten years we have sold to hundreds of satisfied industrial customers ranging from Fortune 500 companies to small machine shops. For a complete interactive online presentation go to the helper on the Chambrelan website which will guide you through the process of selecting the right slide for your application. You can even download CAD drawings of the slide you choose in all the popular CAD formats. Download the Chambrelan catalog or email us and ask us to send it to you. If you need in person help call or email us and we will take care of you. Call 914 241-6900 (a person, not a machine answers the phone during business hours) or email us at sales@alliedinter.com We have a dedicated slide engineer who can provide you with product selection assistance, drawings and CAD files, and pricing. 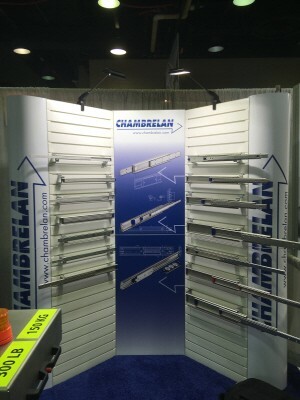 Chambrelan makes a full line of telescopic slides and linear ball rails. If there is a specification you need which is not in the catalog, we have the ability to design a custom part. Over extension,consisting of 4 beams for when you need to access the back of the drawer. Total extension, consisting of 3 beams, for when you need top access to the full drawer. Partial extension, consisting of 2 beams. A food safe grease, combined with stainless steel ball bearings, offers a cost saving alternative to stainless steel slides.